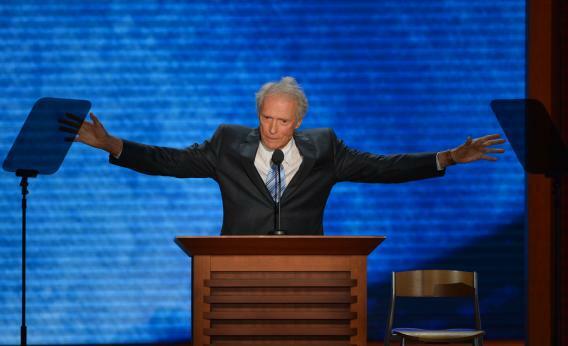 Clint Eastwood's convention speech undermines Romney's message. The last night of the Republican National Convention was, by and large, a perfect marriage of form and message. Romney’s pitch to voters since the primary has been, “Hey guys, you experimented with electing the black guy with the foreign-sounding name, but now that you’ve had your fun, it’s time to sober up and return power to its rightful owners, boring white guys who think a wild weekend is buying a new set of golf clubs.” In service of this message, Romney rolled out a night of endorsements that got across the message loud and clear: Mitt Romney is a comforting, bland white guy in a suit, but one who gets that this is the 21st century. While his personal preference is for a wife who stays home to manage the servants, he’s willing to hire those new-fangled modern women. He’s a genial grandfather type, so let him carve the turkey already. Then Clint Eastwood spoke. Suddenly, we were all reminded of the raving, Limbaugh-loving cranks lurking right under so many of those traditional business suits and affable golf jokes. Watching Eastwood act out his fantasy of standing over the president and lecturing him like he was an errant schoolboy in need of correction brought forth all the unsavory aspects of modern conservatism Romney desperately wanted to spend last night minimizing. Romney wanted to paint a picture of a conservative movement that has room at the table for the voices of people of color and women. Eastwood looked out at the crowd and said, to wild applause, “I would just like to say something, ladies and gentlemen. Something that I think is very important. It is that, you, we—we own this country.” Despite the incoherent, bumbling aspects of his speech, this sentiment—that we, not they, own this country—came across loud and clear. And with that, all of Romney’s hard work putting together a list of speakers that screamed “diversity” and “milquetoast” collapsed, and all before the candidate himself had a chance to speak.